The floating staircase became a reality thanks to new technology and the rise in using architecture as an art form. The cantilevered staircase has grown in popularity with the trend in minimalist design. There are many variations – each one an impressive architectural feat. 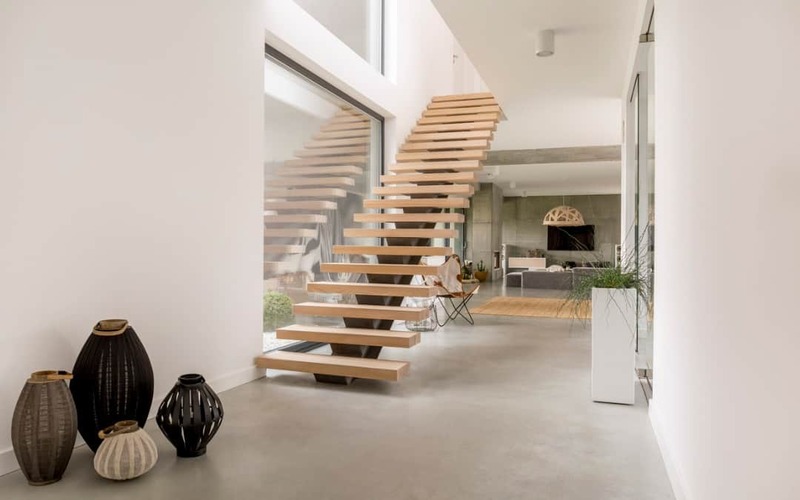 A staircase which has eliminated or reduced the appearance of the structural members to make it look like the stair treads are floating in the air. The support is provided by a wall which the treads are cantilevered from or is hidden under the treads. A floating staircase can also be suspended from the roof with cables providing the support. Due to its minimalist look glass is often used as a support and handrail. Floating staircases are ideal for space and light constrained homes. The open treads allow the eye to see through the staircase making the area feel bigger than if closed treads were used. Light from upstairs can travel down an open staircase so downstairs is not as dark. The client of this stunning Perth home wanted a floating staircase with chunky wooden treads and no visible steel stringer. They also wanted a glass balustrade that had no visible bolts and tall enough to act as the handrail. JAV Developments achieved the clean lines the client was after and made the staircase the feature of the home. A beautiful example of a suspended floating staircase with rods from the ceiling acting as supports and the handrail for the bottom half of the staircase. A floating staircase where the steel stringer is visible. Painted or powder coated black the stringer blends into the background and is hardly noticeable leaving the beautiful white oak treads to steal the show. An industrial-looking residence uses a chunky wooden tread cantilevered from an internal concrete wall. It might be a good looking set of stairs but not the safest with no handrail in sight! Another example of a suspended floating staircase, the thin and simple metal rods blend into the busy wallpaper background leaving the thick, wide treads to feature against the stark white tiles. Good use of lighting to lead the way upstairs. Highlighting the edge of each tread adds to the floating look of this stunning staircase. Not all floating stair treads need to be made of wood. This concrete set of stairs compliments the stone wall that also provides the support for the staircase. Beautiful wooden treads showcased in another example of the minimalist décor look with a low profile handrail. The staircase in your home doesn’t need to be boring. Up the luxury factor of your new home with a set of floating stairs that command attention for their engineering and artistry. 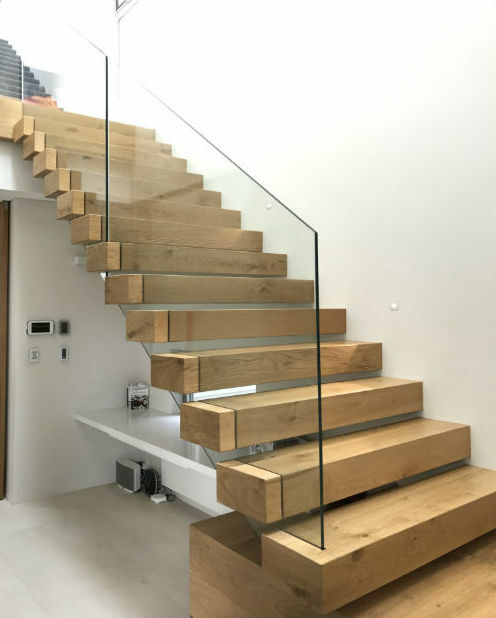 If a stunning set of stairs is on the list for your new home, talk to Alex at JAV Developments by calling (08) 9381 4174 or contact us online for a design you are sure to fall in love with. © 2019 JAV Developments. All rights reserved.